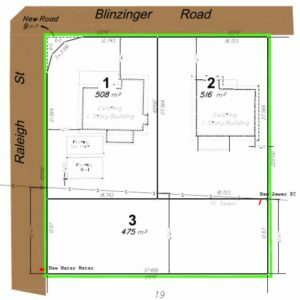 This Town Planning application was done for a Reconfiguration of 2 into 3 Lots located at Blinzinger Rd, Banyo. The total development site area was 1505m2. The lots were zoned under the City Plan 2014 as Low Density Residential Zone. They are located in the Banyo-Nudgee Neighbourhood Plan area. The proposal involved the creation of a 508m2 corner lot (Lot 1), a 516m2 lot fronting Blinzinger Road (Lot 2), and a 475m2 lot fronting Raleigh Road (Lot 3).